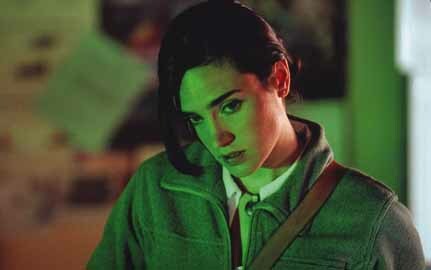 Jennifer Connelly, who plays Betty Ross in The Hulk, said she became interested in the project when she learned director Ang Lee was involved. "I thought, 'Wow, what an interesting combination of elements,'" Connelly said. "As a child of the 70s, I remember watching the television series. And then when I spoke with Ang, he really wanted to make this a psychological drama, to explore the relationships of the families - between Bruce and his father, and Betty Ross and her father. "What I thought was so interesting was the juxtaposition of these really human characters struggling to work out their relationships with one another against the sort of comic book, larger-than-life, 'this guy goes green' sort of elements.'" Connelly's intelligence was a key for her in the role. "I saw Jennifer over the years in many films, but her performance in Requiem for a Dream touched me so deeply for its tragedy and intelligence," Lee said. "She stood out as the perfect choice for Betty." "Ang was not interested in casting the part of Betty as 'The Chick Role,'" said writer/producer James Schamus, "and the first step was to really find somebody who could credibly create the role of a character who is as smart as Banner, if not smarter, and is a scientist in her own right. Intelligence was the first requirement for the part. You don't have to worry about that with Jennifer, who went to Yale and Stanford." The Continuum has obtained 120 new images from the film. Click on the thumbnails below for larger and fuller images.